The straw that broke the camel’s back. Like water off a duck’s back. Oh, my aching back. Backs are designed to withstand quite a lot of stress. Structurally speaking, our spine (backbone) provides structure enabling us to move. Every twist, bend, and nod we make with our body is dependent on the parts of the spine working together. Starting at the base of the skull and ending at the tailbone, the 33 vertebrae and spongy discs that separate and cushion them enable us to move by infinitesimal degrees rather than being, well, stiff as a board. In addition to the structural purpose, our spine also provides a protected passageway for our spinal cord, which is the bundle of nerves that serves as the superhighway of information from the brain to the rest of the body and vice versa. A vast network of nerves constantly sends information along this superhighway enabling us to move, feel, and survive. Given the importance of the spine, it’s easy to understand why back pain can be so debilitating. Back pain can be caused by a variety of reasons. Muscular aches and pains often arise from overexertion or repetitive motion and often can be treated with over the counter medication, a few days of rest, and application of ice and heat. Although most people are likely to have some kind of back pain in their life, the majority of issues will resolve on their own by using these methods. 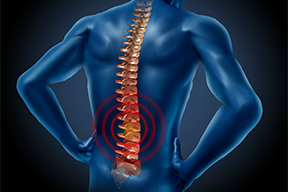 Structural issues, such as damage or stress to the spine itself, also cause significant amounts of back pain. Degeneration of joints, disc problems, stress damage, scar tissue buildup from previous back surgery, or trauma injuries to the back present an entirely different set of circumstances and typically cause chronic back problems that no amount of home-based treatments alleviate. Another common source of back pain is caused by damage to the facet joints–where each vertebra connects with the vertebrae above and below it. These joints can become stressed or damaged, and the cartilage that covers the joints to allow movement wears away allowing the joints to become swollen and eventually rub against each other forming bone spurs. All of these conditions can cause irritation and inflammation, which causes pain. “The pain can be similar, so it’s very important to narrow down the specific cause through examination,” explains Dr. Taimoorazy. Otherwise the patient could experience more back pain from a treatment that not only does not address their problem, but could also exacerbate it. “The nervous system is plastic–it remembers pain,” says Dr. Taimoorazy. When neurons transmit pain signals to the brain, the surrounding neurons join in and new ‘pain’ pathways are formed. It becomes a vicious, and often chronic, problem.” His goal is to diagnose the cause of his patients’ pain and intervene so that the transmission of pain signals is vastly reduced or eliminated altogether. So instead of pain breaking the camel’s back, it could roll like water off a duck’s back…the result of which is no more aching back. You’ve overdone it. Tweaked. Twisted. Bent down to tie your shoe the wrong way. You’ve been in an accident. Your job causes a lot of strain on your back. A variety of scenarios can and do cause back pain. And back pain is nothing to sneeze at (even if a sneeze is what caused it in the first place). A sore back can make even the simplest activities difficult if only because most physical movement involves the back in some way: Sitting, standing, lying down—and the process of getting from one position to another—all involve the back. A person with a sore back feels a direct economic impact as their ability to work may be affected, not to mention the costs of over-the-counter remedies, doctor visits, and other expenses involved in seeking relief. Back pain takes a toll on every aspect of life. Dr. Ben Taimoorazy and the staff at Guardian Headache and Pain Management Institute in Newport Beach, CA work to alleviate their patients’ pain in the most effective and efficient manner possible. To do this, Dr. Taimoorazy first determines what is causing the back pain. “By the time a patient has been referred to me, they’ve tried a variety of treatment options—often including physical therapy, muscle relaxants, anti-inflammatory medications—over the course of 6-8 weeks or so,” he says. He conducts an in-depth physical examination to narrow down what the focus of treatment should be, sometimes using CT scans or MRIs to find the source of the pain. “If, for example, the pain is found to originate in a facet joint, we may first prescribe a short course of oral steroids to help decrease the inflammation,” he explains. In some cases, that may be all it takes to ease the pain because less inflammation decreases the irritation to the nerve. If the nerve is not irritated, it does not send pain messages to the brain. Steroids injections administered under light sedation and real-time x-ray represent another option for eliminating pain in various joints. In some situations, an anesthetic is also included in the treatment. The anesthetic chemically blocks the transmission of pain information to the brain. These treatments are beneficial in that they stop the pain for a period of time and are minimally invasive procedures. If the pain persists, another type of intervention exists in which a small needle is inserted into the nerve supplying the joint. Again, the patient is lightly sedated for this procedure and the doctor uses real-time x-ray to see exactly where to administer the treatment. He first numbs the nerve for diagnostic purposes: If numbing relieves the pain, then he knows he’s found the source and can proceed. The next step is to cauterize the nerve, which effectively stops it from transmitting pain signals to the brain. Thus, the patient’s pain is eliminated. “This procedure is also minimally invasive, so although the pain may come back in 9-12 months (once the nerve regenerates enough to again transmit pain signals), many patients find relief in having the procedure done every year or so,” says Dr. Taimoorazy. A simple but underutilized intervention can be used for the treatment of a long list of chronic painful disorders such as a variety of head pain conditions, fibromyalgia, post herpetic neuralgia, and chronic neck and back pain. The target organ for this treatment is called the Sphenopalatine ganglion or SPG for short. This is the largest accumulation of nerve cells outside the brain. Conveniently located at the back of the nose, the ganglion is easily accessible for a painless, non-invasive and non-addictive nerve block achieved by placement of cotton tip applicators soaked in local anesthetics. SPG block is not a new procedure. It was first described in 1909 by Dr. Greenfield Sluder who was a professor at Washington School of Medicine in St. Louis. The web of incoming and outgoing nerves associated with SPG is amazingly complex. There are sensory inputs into the SPG from areas as remote as the lower back. But more importantly almost all the head and neck structures send sensory nerve signals into the ganglion. Therefore, one can explain the observation that pain in the neck and cervical spine can be referred to the head and face, and alternatively headache in most instances is associated with neck pain. Anesthetizing this ganglion basically serves the same purpose as when we reboot our computers. It is conceptualized that in chronic pain conditions, the pain pathways start acting independently and the nerve cells continue to fire the pain signals even in the absence of the painful stimulus. The same phenomenon occurs with a computer that has been in use for long period of time and may start malfunctioning. The rebooting of the computer basically restores the original settings of the device for proper function. By the same token, performing an SPG block theoretically serves the same function as the rebooting of the nerve centers, and once the normal activity is resumed, nerves function in a more organized and controlled manner and therefore pain is abated. The procedure is performed by a gentle insertion of cotton tip applicators soaked in local anesthetics, one in each of the nasal passages. Due to the action of local anesthetics, nasal passages rapidly become numb as the applicators are slowly advanced. Once in their final position, they are left in place for almost 30 minutes. During this time, you may take a nap, read or watch your favorite show on TV. Depending on the condition, sometimes SPG block has to be repeated on a daily basis or at least every other day with six to seven sessions. It is comforting to know that SPG block is one of the many options available for the treatment of chronic painful conditions. The notion that, “you have to learn to live with pain” seems to be a thing of the past. For more information about back pain treatment, you may contact your local sub-specialized physician Dr. Benjamin Taimoorazy at Guardian Headache and Pain Management Institute, Located in Newport Beach California.